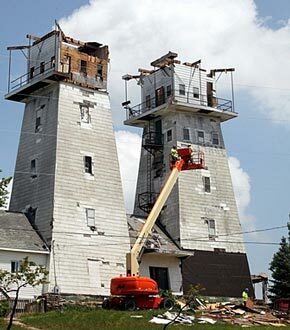 Crews began work this week dismantling portions of the Irish Hills Towers, two iconic wooden observation towers that stood for decades as signposts of a thriving tourist spot before falling into disrepair. Crews from North American Dismantling carefully took apart the top portion of the towers Wednesday. The work is part of an effort to turn the lower portions of the towers into museums, said Donna Boglarsky, president of the Irish Hills Historical Society. The society has an Aug. 1 deadline to raise the estimated $300,000 needed for repairs, or the towers face demolition. The Irish Hills Towers, which were built in the 1920s, are located at 8433 W. U.S.-12 in Cambridge Township in Lenawee County in the Irish Hills region. They were added to the National Register of Historic Places on May 2, 2007. Boglarsky said the top portions of the towers were added in the early 1970s. The Irish Hill Towers were built in the 1924 as observation decks for tourists, but closed in in the early 2000s. 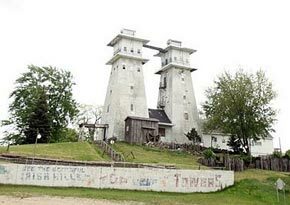 the first tower was built by the Michigan Observation Company, 50 feet tall. The second tower was built by Edward Kelly building it to be 60 feet. This was the beginning of a building competition that eventually ended with the towers being 64 feet. they remained under separate ownership until 1955. “After this crew gets done with this work, we are going to put on temporary roofs and make some necessary repairs to the base of the structures to make sure no more water gets into the building,” she said. The six-man crew’s foreman, Norman Evans, 33, of Leslie, said crew started the job Monday morning and expects to be completed by Friday. Evans said this job is not a typical one for the crew.